Food snacks were definitely favored children and uncomplicated in its manufacture. In a mixer bowl whisk 100 grams of butter and sugar until smooth. Add the eggs one by one while in shake until evenly mixed. Add flour, baking soda, 1 teaspoon vanilla and cocoa powder as she whipped until well blended. Portion batter evenly into the muffin tins. Fill up to three-quarters full. Bake for 20 minutes or until cooked in the oven with a temperature of 180 degrees Celsius. Remove from oven and let cool. 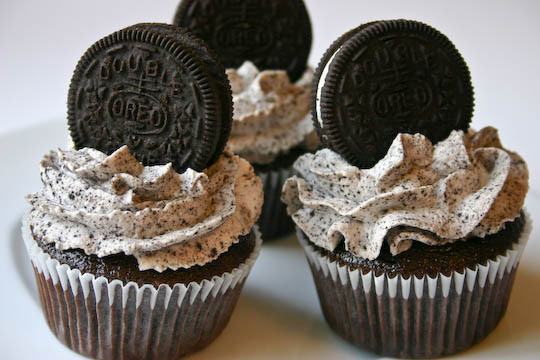 Pour one tablespoon of cream on top of the oreo chocolate cupcakes and topping with 1 oreo biscuits. 1 Response to "RESEP CARA MEMBUAT CUPCAKE OREO COKLAT YANG MUDAH "